One of my favourite pastimes when visiting foodie friends is rooting through their cookery books though I have to admit it's rare to find many I haven't got. But the other day I turned up one called English Country House Cooking by someone of the splendid name of Fortune Stanley. Turns out she - she is a she - wrote in the 70's and has an illustrious background according to this page on the Stanley family tree. The recipe that caught my eye was a cauliflower cheese with onion which seemed an intriguing addition. I didn't have time to jot it down so made up this version when I got home. Peel and thickly slice the onion and put it in a pan with the milk and thyme. Bring to the boil and leave over a very low heat for the onion to cook but you don't want it to boil. Meanwhile divide the cauliflower into florets and steam or boil until not quite cooked (about 7-8 minutes). Drain, saving some of the water. Melt the butter in a non-stick pan and stir in the flour. Cook the roux over a low heat until it it begins to darken in colour and smell nutty. Then tip in the hot milk and onions all at once and stir. It should thicken pretty well immediately - if it's too thick add a splash of the reserved cooking water. Or more milk, if you prefer. Remove the thyme. Add half the grated cheese and season to taste and tip into an ovenproof dish. Heat the grill, top with the remaining cheese and cook until the top is golden and bubbling. The effect of the onion was quite interesting, making the cauliflower cheese milder if anything although that could have been the Gorwydd which is quite subtle and delicate. It would have been particularly good with boiled ham or indeed with some bacon or ham in it though I was trying to keep it veggie. (This blog is sometimes too meaty by half). I didn't take the roux quite as far as I might have done in terms of browning it. I reckon I cooked it for about 3 minutes - I think I'd cook it a minute or so longer next time to get an even nuttier taste. And a little blue cheese might have been interesting. But a nice twist on a family classic. Thankyou, Fortune, for the inspiration. Incidentally the surface of the cauli cheese shouldn't look as crinkly if you flash it under the grill. I had to put mine in the top of the Aga which takes an age to brown things. One of the things that drives me nuts about it. Oh, that looks so good! I've been craving cauliflower cheese since seeing Jamie Oliver do a macaroni/cauliflower mix at the weekend, when I realised that I've never actually cooked it myself- this version is definitely going on my list of dinners next week! Cauliflower cheese is one of my all time favourite things to eat and I will have to try this lovely looking recipie you have posted. I have always just stuck the simple cheese sauce/cauliflowe combination! I've got this book! Think it came from a jumble sale years back. First time I've seen it mentioned anywhere though. 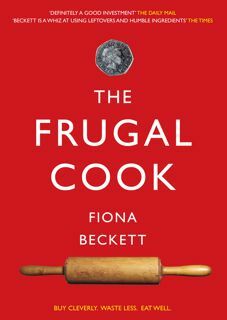 Most of the recipes seem very plain - but tasty - so not extravagant. The savouries are particularly good. I have to confess I've sent off for the book Nikki so will explore the savouries . . . I made cauliflower cheese this weekend. I also added onion and garlic which I fried first. I always steam the cauliflower so it doesn't absorb water, and this time I did some brussel sprouts too for good measure and added veggie goodness. I make the roux with a good dollop of Dijon mustard for kick and used gran padano cheese to reduce the fat content. Very tasty it was. Oooo, great idea to add sprouts, Sarah. I like that. And I was thinking about mustard only I wanted to see how much the onion flavour would come through. Another time I might add a dab of English mustard. Any others got a favourite way of making cauli cheese? Liking the idea of the brown butter, in particular. Wondering also whether roasting the cauli would make this even more wonderful - or perhaps a bit too much with the nutty butter...? I like the idea of adding onion to a British classic. But I would use brocolli rather than Brussels sprouts which always adds a bitter unpleasant nuance to food. I think using extra ingredients gives an otherwise plain dish more interest. As you mentioned macaroni cheese, even I have to add ham, mushrooms and tomatoes to make it more interesting to eat. Heresy, Robert! Macaroni cheese uninteresting without additions? Can't have that! Love this blog, very inspiring! I have always loved the combination of cheese and cauliflower! So perfect and nice. Thankyou Jen. I know I shouldn't moan about the Aga. I do love it really - it's brilliant at the things it does well but browning isn't one of them! 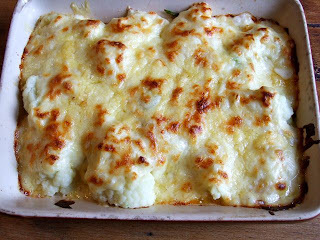 Cauliflower cheese - count me in. Looks delicious. A very bright idea to save scratches. I've used one of your recipes to make pasta with cauliflower tips and it was fantastic. Just perfect way to start eating the more affordable but healthy way. Following your recipes, thank you.